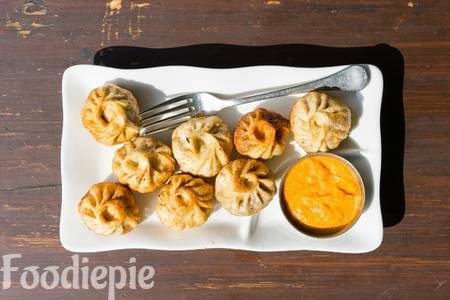 Fried Momos is another favorite snack recipes, apart from steamed mamos and Tandoori Momos. So delicious to eat and very easy to make! Steamed vegetable Momo is a popular and most favorite recipe from Tibetan and Nepalese dishes, but now also there is a popular street food in India. No oil is cooked in this homemade dumpling steam and thus makes a healthy meal. But today we have a wonderful wonderful recipe for fried mamos for you. Apart from boiled Momos, fried and tandoori Momo are two other variations that everyone loves to eat. So, try this classic fried mamos recipe to follow step-by-step instructions. Surely everyone will definitely love to eat this fried Momos. let's Checkout recipe. Step 1 : Take out the flour in a vessel and add 1/4 teaspoon of salt in it and pour a little bit of water and mix it with soft dough. Apply a little oil on your hand and make the dough smooth. Cover the kneaded dough for 15-20 minutes, so that flour is set up for better results. Step 2 : Wash off the cabbage thoroughly and grate it and peel the carrots and wash it thoroughly and clean it. Step 3 : Heat 2-3 teaspoons of oil in the pan, add grated ginger in hot oil, fry a little bit of green chillies, turn off the gas and put the roasted spices in the grated vegetables. Add 1/2 tsp salt and finely chopped coriander and mix all the ingredients well. Stuffing is ready for filling in momos. Step 4 : The dough is ready to be set, take a little oil on your hand and grate the dough to smooth it. Make little small rounds of Chapaties from the dough and keep it covered so that it does not dry up. Step 5 : Make all the small round chapaties like that,make center of chapaties ticker as compared to sides. Step 6 : Put one chapati on the palm and keep 1 to 1.5 spoon stuffing in it; Lift the edge from one side and start pleating fold the edge little inside and little outside alternatively.Join them in center and seal it.Prepare all the momos like that. Step 7 : Before frying the momos we have to cook in steamer for 5 minutes. Step 8 : Leave Momos for 5 minutes to cool down. Take Momoz into a bowl after a little cooded. When to serve Momos, then fry the hot momos. Step 9 : To fry Momos, add oil to the pan and heat it. Put Momos in medium hot oil. Fry them on medium-low flame until it turns golden brown. When the golden brown color of the candle is around, then keep it on the clean plate for remove excess oil from them.When it done then again fry for minutes. Finally : Serve hot tasting hot fried mamos with the hot chili sauce , tomato sauce or white sauce and eat it.